Laura is the Managing Director of Endeavor Miami, whose mission is to select, mentor and accelerate the growth of high-impact entrepreneurs in South Florida. Endeavor Miami currently supports 22 companies. Prior to joining Endeavor, Laura was at Visa where she held several roles, including product development and management in the B2B sector, as well as negotiating and structuring new business opportunities, and monitoring strategic investments. Laura has a strong M&A and private equity background. Prior to Visa, she was Head of Investor Relations and a Senior Financial Analyst, M&A for Panamco, a US$3.6 billion Coca-Cola bottling Company sold to FEMSA and an Analyst at Bank of America Equity Partners. Laura has an M.B.A. from Harvard Business School and a B.S. in Economics from I.T.A.M. in Mexico City. Laura serves on the Board of Advisors of Miami Dade College´s Idea Center. 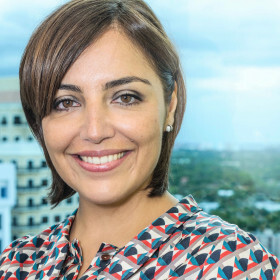 As a current Board Member of the HBS Club of South Florida, she has helped raise funds for scholarships for South Florida non-profit leaders to attend an executive program in HBS for the past 11 years.